Read and follow these rules, terms and conditions before posting to make Habbox Forum a safe and enjoyable place. Official Habbox Announcements regarding staff changes and other important issues. See which departments are currently seeking new staff! Can you defeat Thugs Bunny? All the information you need to participate in HxEE can be found here! What’s the latest in Habbo? Been banned and want to vent? Find it all here! 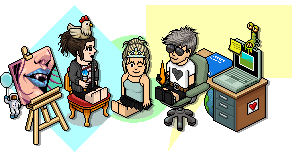 A place to post your cool rooms, alteration - anything creative to do with Habbo! Trade your items, find that perfect bit of furni, or ask a trading-related question! A place to discuss anything and everything about music. Discuss all console and PC games; from The Sims to Fortnite, Runescape and Mario Kart! Want to discuss your fav book or comic? Podcast, anime? Post in here! A place for anything that doesn't fit anywhere else! Here you can play any games you like. [Life] Plans for the long weekend? Debate the hottest topics and win prizes!